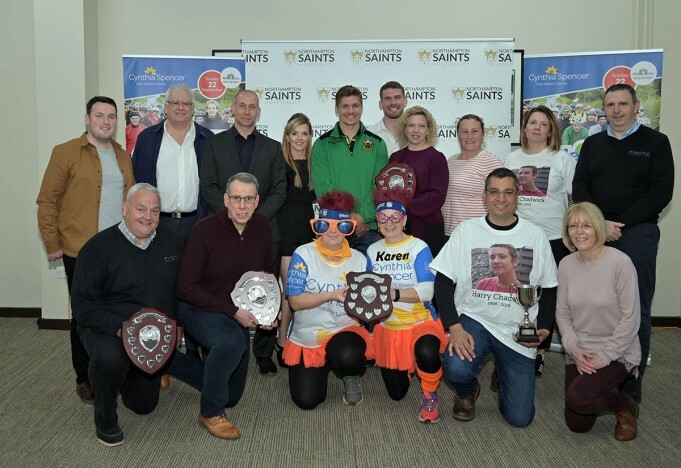 Saints star Piers Francis has poured praise on those pedallers who ignored the rain and turned out in force last autumn for the county’s favourite annual bike ride, Cycle4Cynthia, as he helped launch the event for 2019! The centre, who is a passionate cyclist himself, was on hand at Franklin’s Gardens (Tuesday 2nd April) to pay tribute to the hundreds of riders who, despite the miserable weather at Althorp last September, took to two wheels and whose remarkable efforts have added a further, impressive £65,000 to the coffers of Northamptonshire’s Cynthia Spencer Hospice. Among them was Jessica Pilkington, who led a team of 17 cyclists in memory of her son Harry Chadwick, who was just nineteen when he passed away last March. Having been given the opportunity to meet others with cancer as a patient at the day hospice for the year before he died, Harry’s last days were spent at home and it was in enabling that move to familiar surroundings for which Jessica says she couldn’t thank Cynthia Spencer and its Hospice at Home Team enough: “My sister had lived out her final days at the hospice, where we all experienced the wonderful care of the entire staff, but that Harry was able to die at home, surrounded by his family, was an incredible gift” explained Jessica. “So although last year’s ride was only six months afterwards, we knew we just had to ride as we wanted to show our immense gratitude in the best possible way - by raising money and ensuring that others have access to such amazing support should they sadly ever need it” she added. Indeed, Team Harry’s generous donation of £2600 – taking the total raised in the fifteen-year history of the event to almost £600k - ultimately saw Piers award Jessica and the team with the Chairman’s Cup, a trophy which is given to someone whose special efforts represent the ‘spirit of the ride’. 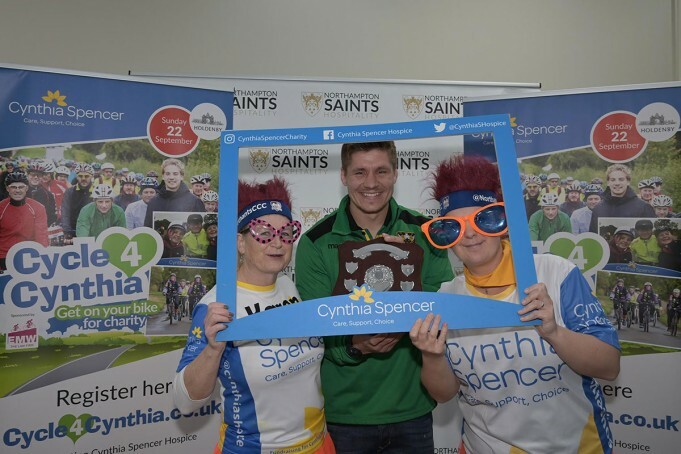 Piers also presented the other 2018 trophies, including that for most money raised by an individual, which went to Gary Denton for collecting over £500, to the biggest team, won again by Shirefit East Northants with 52 riders, and for the best fancy dress, which went to friends Lynsey Brecani and Karen Eke, who were again sporting the colourful tutus, socks and outsize sunglasses which had brought grins to their fellow riders’ faces at last year’s ride. Meanwhile the award for the corporate team raising the most money went for the second year running to Northampton firm Piroto Labelling, whose 40 cyclists raised more than £7,000, taking their two-year total to more than £22k. They were riding in memory of their colleague Laura Silk who passed away at Cynthia Spencer in 2017. As well as the trophy presentations, guests also watched a video of highlights from last year’s ride and a second demonstrating the impact of the Hospice’s Wellbeing service, which allows patients and their families to achieve the best possible quality of life and live as actively as possible until they die. The launch also provided an opportunity for the Hospice’s fundraising manager, John Helm, to thank the event’s continuing sponsors, including leading commercial law, EMW Law LLP, who are headline sponsors for the second time, as well as timber merchants and countrywear specialists, Linnell Bros Ltd, and lettings and sales agent, Chelton Brown: “The generous support from our sponsors covers much of the ride’s costs which means that the money raised by the riders can go directly towards funding our vital care” explained John. “Cycle4Cynthia is our biggest fundraiser in the year and £64,807.67 is a fantastic total, especially when you consider how the weather tried to interfere, so we’re incredibly grateful to everyone for their support and would encourage anyone with two wheels to take part this September and help make it the best ride yet!” he added. Indeed those were sentiments echoed by Piers, who concluded the launch by commending all of those who took part in 2018, as well as the sponsors, marshals and volunteers who helped make that fifteenth ride such a success and urged everyone to sign up for this year’s event: “Tonight’s launch has been both emotional and inspirational and I applaud all those who have helped raise such an amazing figure to enable the Hospice to continue its outstanding work” said Piers. “The only thing that’s going to stop me from riding this September is if we have a fixture that day but, otherwise, I shall be there to show my commitment to this most remarkable of charities and I hope there will be many hundreds more who will sign up and join me!” he enthused. Cycle4Cynthia 2019 will take place on Sunday 22nd September at Holdenby House by kind permission of James and Karen Lowther, with 5, 25 and 50 mile routes on offer. Meanwhile, to keep up to date with the latest news on the event, please visit and ‘like’ the ride’s and Hospice’s page on Facebook.